As organisations increasingly leverage virtualisation and public cloud architectures with delivery models such as IaaS and PaaS, encryption is increasingly becoming a requirement to ensure sensitive assets remain secured in dynamic, multi-tenant environments. 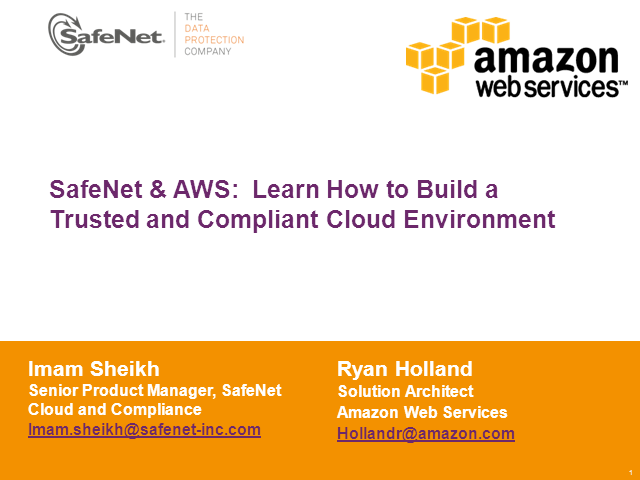 Join your fellow professionals from AWS & SafeNet to understand what it means to offer a compliance ready infrastructure and then to hear live examples of cloud migration. Then discover how encryption plays a critical role, whether to combat increasingly sophisticated cyber attacks or to ensure compliance with internal policies or regulatory mandates, in order to maintain trust and ownership of your data in the cloud or virtualised environments. Ryan Holland brings over 15 years of IT industry experience to his role as Ecosystem Solutions Architect for Amazon Web Services where he focuses on enabling security partners. Prior to joining AWS Ryan worked at Trend Micro where he managed technical business development for Cloud and Data Center Security and previously to that several roles in areas of data security and encryption technologies. Ryan Holland holds a bachelors of science degree in computer engineering from the University of California at Irvine as well as a CCIE certification. Imam Sheikh is the product manager for virtualization and compliance products at SafeNet. He has more than 15 years of high-tech industry experience, specializing in security. During his career, he has held several technology leadership positions. Imam holds an MBA from Santa Clara University, and he has spent the last decade at SafeNet in technical and management roles.